It was always going to be a very different race in 2018. 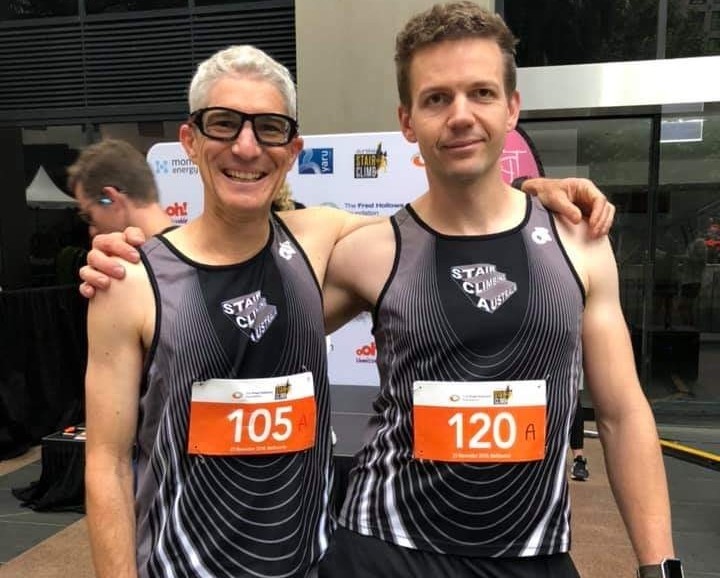 Seven times winners Mark Bourne and Alice McNamara found a clash in their schedules and had to make the hard decision to miss Eureka Tower this year and travel over to Shanghai for the World Tour Final. For the first time in a long time, new winners would be crowned. With no clear favourite it was unclear who would win. One thing was sure, time gaps would be tight for the top stair climbers. At the start line it was great to see some top performers from interstate travelling to Melbourne to compete. Young rower Matt Curtin appeared at the starting line, in town for a rowing regatta that was on the day before. Surely he would have to be considered a favourite after his win in Sydney a couple of months ago. Matt’s rowing mate Jack Hanley who finished 3rd in 2017 was also at the start but claimed to be a little under the weather and not feeling like he would perform. With Peter Reynolds (2nd in 2017) and Aaron Knight (4th in 2017) both not racing there were quite a few hopeful of a good result including Nick Clarke (2nd in Sydney), Scott McGraw (former 2nd place runner), Peter McNamara (consistent top 10er over many years), and Jason Williams (5th last year). The women’s race saw a match up between Meg Reeves and Brooke Logan. Meg finished second to Alice McNamara in 2017 by just 0.8 seconds. Brooke was coming off an impressive 3rd place run in the Vertical World Circuit race in Osaka, Japan just 3 weeks earlier. It was going to be a tight race. The funny things about a stair climbing race report is that we can’t report on what happening during the race. We don’t see anyone from the time they run into the first stairs until they cross the line on the 88th floor. Each competitor sets off in 30 second intervals and have their own personal battle as they fight to reach the top as quickly as possible. The finish line was the usual battle scene of racers collapsed on the floor immediately after the finish line, all trying to get their breath back under control and to rest weary legs. Matt Curtin had repeated his Sydney win in a time of 9:15 and Meg Reeves had bested Brooke Logan by just 6 seconds in a time of 10:24. The men’s podium turned out to be identical to Sydney with Nick Clarke in 2nd (9:37) and Jason Williams in 3rd (9:43). The closeness of the race is shown when you consider 4th to 7th places were all within 20 seconds of Jason. In the women’s Emily Ritter finished in 3rd in a time of 11:16. It was a great morning of racing, and our thanks go out to the Fred Hollows Foundation for all their work in their first year as event organiser. And thanks must also go to the nearly 2000 people who took part raising over $200,000 for Fred Hollows and created the great atmosphere of the day. For Mark Bourne and Alice McNamara their trip was worth it with Mark coming second in the men’s race and Alice 6th in the women’s. Let’s see what happens with next year’s race calendar to find out who will make it to Eureka for 2019. Jason Williams and Ed Manktelow representing SCA.